Mamma is called the first Meta search engine. The engine is developed as a Master thesis at the Canadian Carleton University, Ottawa by Herman Tumurcuoglu. 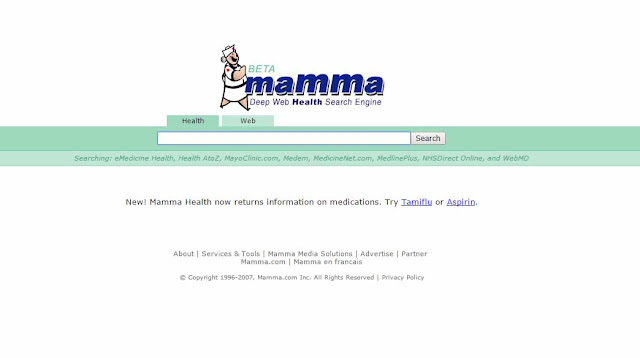 Mamma started in 1996 and works till today as a Meta search engine. Since 2005 they offered an image, video and news search to. Additionally they offered a job and health search since the middle of the 2000 years, but both are closed after nearly three years [kd2016]. 2007 - 2008 Copernic Inc. Source: Mamma: What is Deep Web Health Search?